Since we seem to be on a bit of a mining theme this week, I thought I’d look for images relating to a couple of the areas discussed in the comments section to my recent posts. 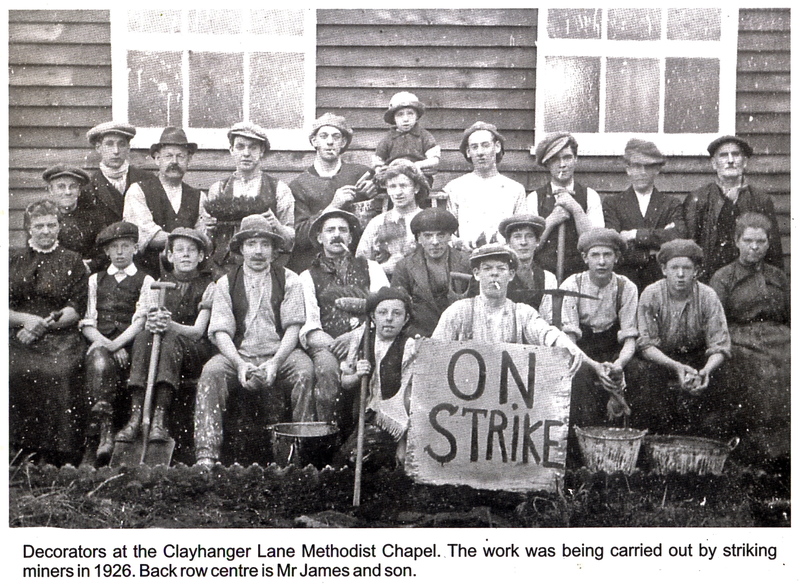 For this week’s old photo feature, I’ve dug out some photos of mining on or around the common, and of Coppice Lane. 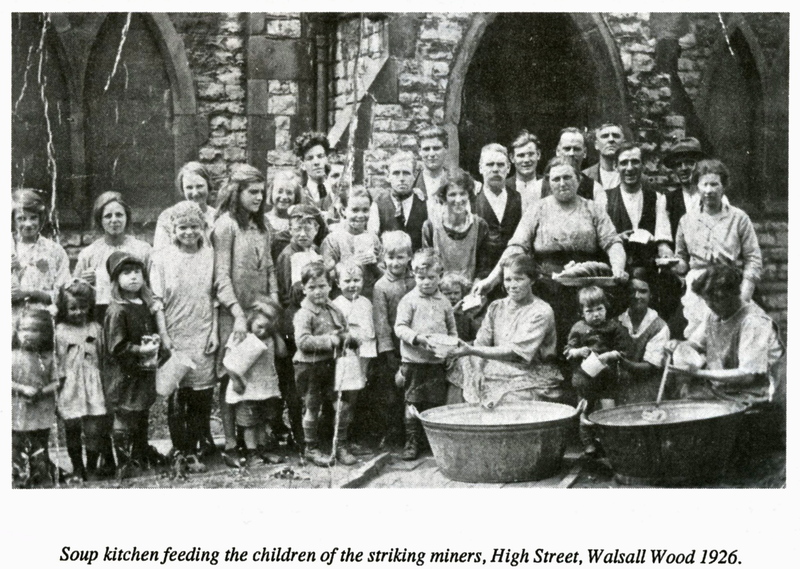 Lisa also mentioned the striking miners, and there’s a couple of excellent images of Walsall Wood soup kitchens that I’ve not featured before. My sentiments toward miners and the mining industry haven’t changed, and neither has my attitude to pointless statuary. One look at the faces of the people pictured here shows how hard and brutal life in the pits was. The best way we can value and respect the huge suffering and sacrifice of these people is to tell their story and remember the lessons that they taught us. One evening this week I stood in the middle of the woodland that sits on the common where these men would have worked; all I could hear was the rustle of leaves and chirping of birds. I tried to imagine the sound and fury of an industry in full pelt, and could not. Their legacy was the better world I was standing in and generations of people who no longer had to do what they did to survive. I will continue to bang on about this, and will make no apology for it. As ever, I salute all those authors whose work shines a light into the darkest corners of our local history. Please buy copies of their work whenever you have the opportunity. Without them, we’d know little of the time. Looking at it broadly, young silver birches and apparently clay soil, the landscape hasn't changed much. 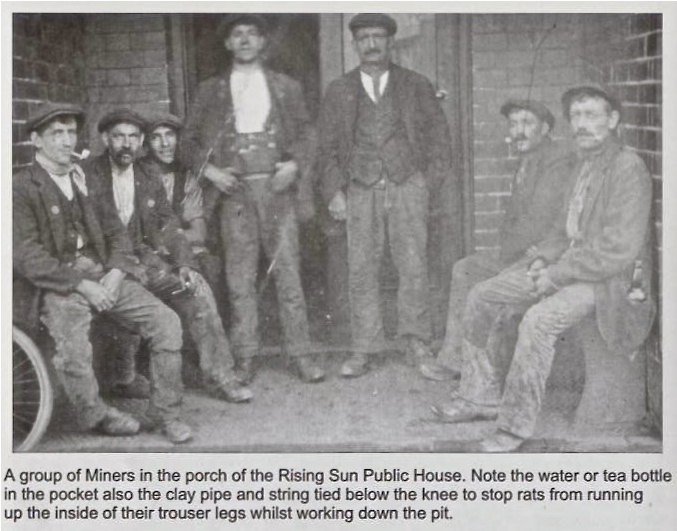 From 'Coal Mining in Walsall Wood, Brownhills and Aldridge' by Brian Rollins & Walsall Local History Centre. This is a relatively common image, but bears showing here on the blog. Notice the odd positions and posture of a couple of the men - that's not just photo-awkwardness, they worked in cramped spaces and suffered as a result. Taken from 'Memories of Old Brownhills' by Clarice Mayo & Geoff Harrington. Can't place this - seems busy, and none of the familiar landmarks. Anyone got any idea? The scan for the original book was bad - note the typesetting is straight, but the image skewed. Taken from 'Brownhills & Walsall Wood on Old Picture Postcards' by Jan Farrow. I think this image was probably contemporaneous with the one from the Rising Sun, above. Interesting that the used their strike time for the community. Taken from 'Memories of Brownhills Past' by Clarice Mayo & Geoff Harrington. 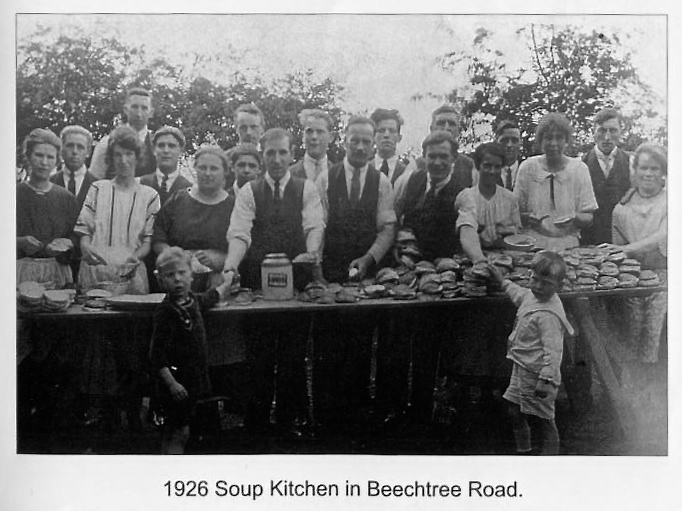 Soup kitchens such as this were common - I'm always shocked at how familiar the faces of the kids are. Put them in modern clothes, and they could be seen in any local street. 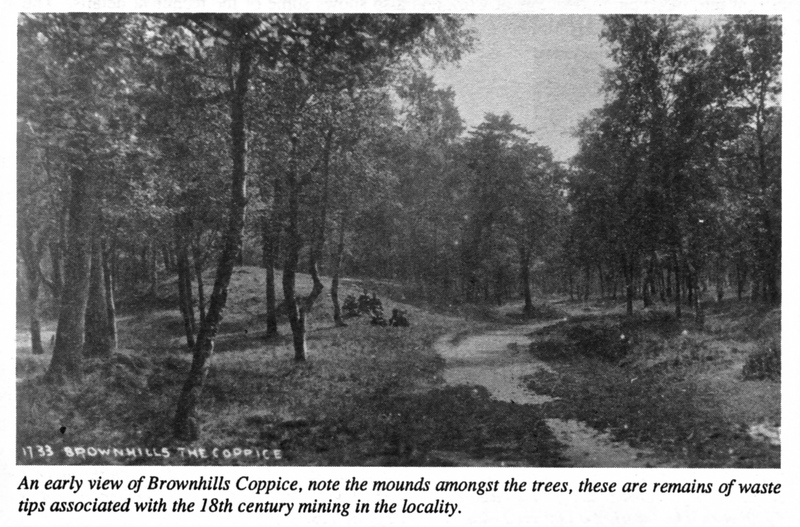 From 'Coal Mining in Walsall Wood, Brownhills and Aldridge' by Brian Rollins & Walsall Local History Centre. Another soup kitchen in Walsall Wood - accepting charity cannot have been easy for many. That's a fine collection of pies, too. If you look closely, some of the ladies here feature in the previous photo, too. From 'Memories of Old Walsall Wood' by Clarice Mayo & John Sale. This entry was posted in Brownhills stuff, Environment, Features, Followups, Interesting photos, Local History, Local media, Reader enquiries, Shared media, Shared memories, Spotted whilst browsing the web, Walsall community, Walsall Wood stuff and tagged Birch Coppice, Brian Rollins, Brownhills, Brownhills and Walsall Wood in Old Picture Postcards, Brownhills common, Brownhills Coppice, Brownhills local history, Clarice Mayo, Coal mining in Brownhills, Coal Mining in Walsall Wood brownhills and aldridge, colliers, Coppice Lane, Geoff Harrington, Jan Farrow, John Sale, Local History, Memories of Brownhills Past, Memories of Old Brownhills, Memories of old Walsall Wood, miners, Miners strike 1926, mining, New Photos, Old pictures, Rising Sun, Soup kitchen, Staffordshire, Walsall Wood. Bookmark the permalink. 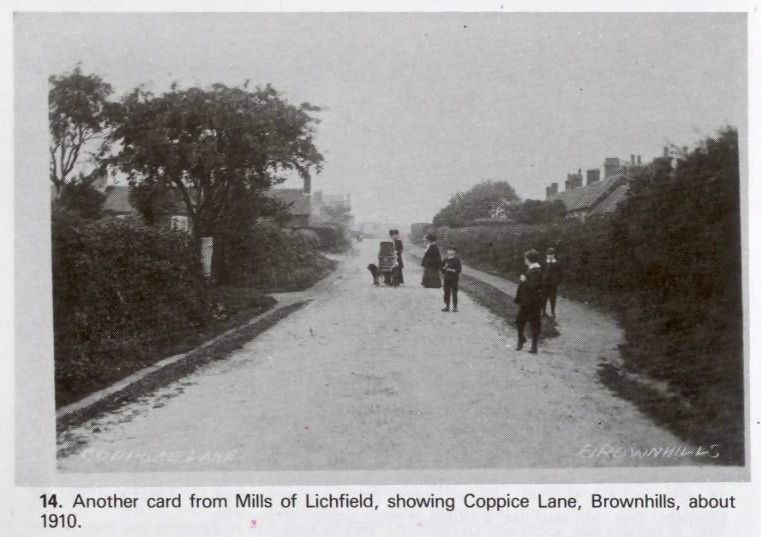 My guess is that the photo was taken from coppice side looking north you have the terrace houses on the right and the houses on the left are coppice cottages the house furthest away is the one that stood on Coppice lane and the brickworks would have been behind that. It’s the only orientation I can see that matches you need houses on both sides of the road and that’s the only spot in the immediate area. I think you’re right. It’s certainly an interesting angle. both were published by Putura Publications in the 1980s. There was a copy in Brownhills library some time ago. I think this is great. Would be really nice to find out the names of the people in the photos. The image on the front cover bore no relation with the real Heath End, though..as you realise when you read the novel! My grandfathers step mother is on the pictures of the soup kitchen. She’s seen handing a lsice of bread to one of the young kids on the last but one picture…. My great grandad is standing on his wife’s right hand side in that picture. He’s the one with the huge mustache and waist coat. Great post as ever Bob. In the last pic in Beechtree Road, I don’t think they’re pies but baps. They seem to contain something dark, which perhaps could be a thick slather of jam. Meat would seem a bit extravagant, though maybe it’s something such as brawn?